Do I have a giveaway for you today. One of my all time favorite shops Darlybird has put together the ultimate package. It's vintage and feminine, fresh and funky. Born from a love for fresh design that doesn't break the bank, Darlybird is the brainchild of a stay-at-home mom slash creative-guru-wannabe who decided to take a risk and have fun at the same time.. Darlybird is all about gotta have non-essentials. An oxymoron? Nope. We specialize in definite hodge-podge of the hard-to-find, one-of-a kind and well designed. The perfect shop. Absolutely. Take a look and you'll agree. I promise.. Now without further ado check out the amazing package up for giveaway today. A sophisticated, yet swirly glass stone sits atop an adjustable gold-plated band. Limited edition. These bursting, blooming beauties are made from old one-of-a-kind plastic flowers. The perfect shade of red. 1950's petals paired with vintage black faceted glass stones. A little big flamenco, a little bit sassy and a whole lot of pretty. You all know I love a good party.. these would be perfect for a circus theme, valentine's day, christmas, or just for every day fun. Best part, they are grease proof. Absolutely stunning. The perfect feminine touch for your table, or patio set, but they're wipeable and rinseable. Music to my ears! Add a little extra sparkle to your salads or give the perfect hostess gift. One set = two spoons. Fill in the blanks and check the boxes to ensure peace of mind for both you and your sitter. Whew! Can you believe it? All items I'd love to have or to give. Take a peek, browse the shop and tell me what Darlybird items you'd love to give or receive this Mother's Day. Good Luck and Thank You Darlybird! Cute, cute stuff. I have to say that the vintage flower earrings are my favorite; I love the Willa and Karenina the most!!! I love the vintage posy clip! How adorable! How I love the Cuckoo-Rickoo Clock in Pink. It would be a beautiful and colorful addition to my daughter's otherwise white nursery. Thanks for sharing the site! And Happy Mom's Day to you too! Cute stuff! I love the Plain and Simple Cake Stand. What a great store! I'm loving the vintage bracelets. The olive is my favorite. Great stuff! Great store. I love the jewelry, and the salad servers are fantastic. oh there is too much to choose from... possibly a handbag! I would love some of those cute vintage flower earrings. Adorable. But I would get my mom cupcake liners. She would love them! Oh, what beautiful accessories are to be found in this shop! I would love to buy ALL of the earrings in this shop. The DarlyNest and Vintage Lindy Earrings are especially beautiful! Thanks for the chance to win. I love the Vintage Flora Earrings... I could use a splash of color in my wardrobe! ooo i LOVE the vintage monica necklace. and I'd love some of those salad tongs too! love all the fabric garlands .... and the cake stand! The posy clip is too cute...came looking for something else and found so much more! What a great little store! I *love* the kids Monkey dining set. Oh I love all the jewelry! Please pick me! I love the petit four cake stand and all the adorable cupcake liners. I love the vintage hair clips. What a great little shop... I can't resist those wonderful garlands. My favorite? The brilliant butterfly garland would look wonderful in my daughter's room. The vintage flower earrings are beautiful, too. So many delightful things! I'm loving the Vintage Diana Ring. I love everything really. Thanks for introducing me to a great place to shop! I will be back! i love the carved rose ring. my middle name is rose so I think I definitely need one! I love the Sophie bow belt...so darling! I love the Queen for a Day Earrings! I LOVE Darlybird! I esp. like all the vintage flower earrings and the green Frame wallet. Fun stuff. I'm diggin' the vintage flora earings! Very cute stuff! I think the paper daisies and lanterns would make GREAT party decorations. Great stuff! Such a fun variety! I have been in a cupcake making phase of life....so I obviously love all their cupcake liners, candles, etc. I love the bracelets! Crossing my fingers. The DarlyNest earrings are just too cute to pass up! love love love this shop! I've wanted their plain and simple cake stand for about a year! I love all her stuff! I will be moving to a new state on Monday so my Mother's Day is gonna be slim pickins! I would love this happy mail! What an awesome giveaway! Love all the products! 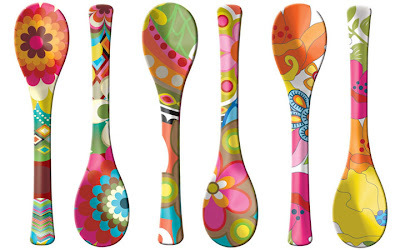 Love the funky salad servers! They would jazz up my meal! I love the floral spoons, so fun. I LOVE the vintage coral ring. Awesome shop! Nicole D.
i love darly bird...such fun stuff! Oh wow...I'd love to have the Lucy Carry-All in Red. So beautiful! I love all their hair clips. Cute for both me and my daughter to wear. I can't decide which I like more, the Jellicle Rose or the Vintage Posie. I really like the Jellicle Rose hair clip. I love big flowers! I'm loving the vintage Mathilde hair clip...actually, all the hair clips! What a wonderful shop! I love the vintage posy clips! And truly, the babysitting checklist is a must have! Thanks for sharing the site! Oh my goodness! Look at that fabulous package! I actually really love the notepad list. We have the meal planning one by the same company and it is SO helpful! The earrings are darling too! LOVE! I would love to win that vintage betty ring! Wow, what an amazing giveaway! I have been wanting some of those vintage floral earrings for a while now. I also love the Vintage Lucy necklace. I am in the mood for some earrings! Holy moly! Such cute stuff!! Im especially loving the vintage jewelry! SO CUTE! the salad severs, the earrings, the rings... I'll take it all! 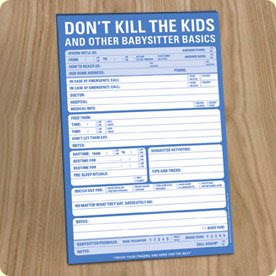 that dont kill the kids babysitter note pad is AWESOME...I ALWAYS leave notes for them, and so I LOVE LOVE LOVE that! I love this stuff and would love any of it. The Darly Surprise Bag of Goodies on their website looks amazing too!! Don't Kill the Kids. Awesome. With my flighty brain, I so need that. I'd love to give a friend the Sophie Belt, I'd love to give the butterfly garland to my girls, and I'd love to get the Plain and Simple Cake Stand. Definitely a fun shop! I love the games and toys for the kids...particularly the blank board books. For moi? any of the earrings! I love the party stuff...the cupcake liners, cake stand etc. I want it all. There is too much cuteness to choose from! Maybe a pretty braclet? love the ring & cupcake liners. Oh my oh my!!!! I love the vintage flora earrings, cupcake liners, and salad servers! Oh my, I've been wanting a big babble ring for SO long now. I'm holding out hope that I'll win! ooooohh, ahhhhh, earrings & babysitter notepad for me, please an the salad servers for my friend! What a great giveaway and now I have another site I am addicted to!!! I like the Plain and Simple Cake Stand (multiple colors) in bluebell! So sweet! I love the rings, the aprons, and especially the hair clips. Now I just need my 1 1/2 year old to get some hair for the clips! Okay everything is adorable, but all the rings caught my eye! i love the darlybird shop! 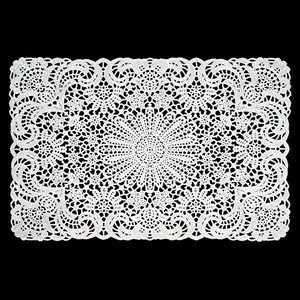 my dream gift is the plain and simple cake stand. i love the bobbies, the necklaces, and the rings. it's all great stuff! salad servers, or the cupcake liners...so so cute!! I love Darlybird and could use some fun salad servers, maybe that will help me eat more greens! I love the salad servers or ring. Retro and cute! The salad servers are so fun! Fun! I like the floral salad servers and the vintage Olive bracelet. i just love love love the salad servers. i have already pictured myself, hosting a small gathering, serving up something delicious with them! Oh my...I already have such a love of that shop. I have the roboto fabric garland up in my baby boy's room and would love any of the pink ones for my girl. I'd love to give my mom the Molly Bucket Bag in green. She'd love it! I love the fleur tee for my daughter! What a fun store! Thanks for finding it for me! I love the olive bracelet. Oh my goodness. I am drooling! I love this site! Thanks for sharing it. I love the necklaces, especially the Rosebud Retrolite. The paper lanterns are beautiful; I wish I could buy them all. I could also use everything in the "Yum" section, especially the cupcake liners! I'd love to give or receive the Happy Days Garland. A great way to spruce up a wall and/or decorate for a party! the plain and simple cake stand? frieda tote? geometric servers? I'd be happy if my husband remembered mother's day... period! I have been eyeing the blue cake stand for AGES. Oh man, where to start??? I love the garden spoons, cake platter, garland, finger puppet bag, hand made fruit and veggie rattles, handbags... I just would love the whole shop! wow, neat stuff! I love having family photos on the fridge, and I love magnets. With the Rococo Magnet Frames, I can combine the best of both and add some color to the kitchen too! I personally love the Vintage Goldie Necklace. Very cute. I'd gift the "Palace Opal Crystal Earrings" to my mom and keep the "Olivine Crystal Dangles" for myself! I've always adored those salad servers - I've got plain serving dishes and those would add a little pizzaz to my dishes. I really love the placemats! They are so pretty and would look so great on my table every once in a while! I also want almost everything in their store... especially the plain and simple cake stand! ok, i meant to just flit over there really quickly, but i got sucked in by all the lovely, lovely stuff! too many pretty things to name, but one of my favorites is the pink little caged bird. What a fantastic package! I love the pinstripe cupcake liners...so cute! My sister would love the vintage betty ring. and I would love to give it to her! What fun...love the salad spoons and cupcake wrappers! I love the Vintage Eden Necklace! I love the fabric garlands. so cool for simple get togethers. I would love to receive the Plain and Simple Petit Four Cake Stand. It's simple and perfect for all the baking I do. I love love the salad servers. Very fun. Pick me! Oh, how I love the molly bucket bag in lime! I want it all... but mostly that babysitting list. I always seem to leave something out. Oh my goodness, what a giveaway! I love their jewelry and hair clips. So cute! I woild love those vintage flora earrings! I have been debating on buying them for a while. i love darlybird! love those salad servers. and how about those posy clips? can't get enough! What a fun site! I'd be hard pressed to pick a favorite cupcake liner or party decoration, especially with our one-and-only at college facing her first b-day on her own...but I'd love to send her the "Tea Time Fabric Garland" to brighten up a corner of her room. "Prudence the Owl Friend" would be a perfect and darling inside joke gift. For me: hands down, the Vintage NieNie Earrings! They are so NieNie! Love her!! what, I love those earrings...so cute, and the salad spoons are awesome, the bright colors are fab!!! I would like the Diana ring. I also like the photo mobile. I like the "Plain and Simple Cake Stand" in blue. I love the hand knitted fruit and veggies, so cute! I love all of their hair pins. I have one from them that I wear every day. This giveaway is amazing! I must find a room for the "youngsters" cuckoo clock. It is perfect. cute website. I really love the garland yet another new thing you've shown me. thank you! I adore the salad servers and vintage flower earrings! Great stuff! Lizzy S.
I love the molly bucket bag. So Cute. I like the Vintage Elyse Bobby! I love the vintage sophie earrings! So many cute things! I love the super colorful salad servers and the red and white cupcake papers. that adorable pink cake stand is calling my name! The salad servers are precious! I like a lot of their stuff but my favorites are the beatle magnets, the salad servers, and the beatrix ring. Love them. oh me oh my how i love darlybird! i love the salad servers plus that vintage betty ring is just fantastic. I love the flower earrings. So cute for spring! i am loving the molly bucket bag. nice space and great colors! Wow..way too many cute things to narrow it down, but if I must I love the children's aprons, the magnetic butterflies, oh and those cupcake liners are just darling! love all the give away items. on the website i really like the Jellicle Rose Hair Clip. it would be adorable on my little izzie. I adore the cupcake liners! How fun. I love the salad servers! So fun and unique! What a great place to find unique gift's for those people who have everything. Now I know what to give my sister for her birthday...I am totally ordering her that Queen of Hearts Locket Bracelet! Those salad servers are awesome. I would love those in either the geometric design, or the floral. I also love the plates that match...and the platter! It would be really hard to choose if I win! I'd love to give myself the Beatrix Frame Wallet, though I'm sure my mum would love some cupcakes nestled in those gorgeous pinstripe cupcake liners! A perfect gift would be the cake stand and the tulip cupcake liners :) But I know my mom would love all the handbags. Thanks for so many great giveaways. the vintage mila necklace please! I love all the kids stuff, but I really loved the knit doughnuts. Love her stuff. I'd love any of the cakestands or serving platters. Vintage Francis earings are so darling. How are people so creative!!! The salad servers are adorable! Love the cupcake liners-- super cute and would be great for Memorial day weekend cupcakes! everything! but i love cake stands and the cupcake wrappers are super fun. Hard to choose, but I have always loved their items for children...especially the knit food! I love the salad servers - so fun and different than my boring wooden ones! !